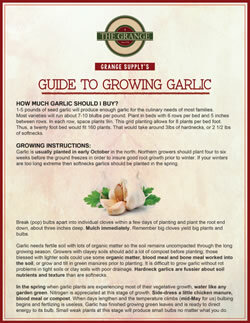 1-5 pounds of seed garlic will produce enough garlic for the culinary needs of most families. Most varieties will run about 7-10 blulbs per pound. Plant in beds with 6 rows per bed and 5 inches between rows. In each row, space plants 9in. This grid planting allows for 8 plants per bed foot. Thus, a twenty foot bed would fit 160 plants. That would take around 31bs of hardnecks, or 2 1 /2 lbs of softnecks. Garlic is usually planted in early October in the north. Northern growers should plant four to six weeks before the ground freezes in order to insure good root growth prior to winter. If your winters are too long and extreme, then softnecks garlics should be planted in the spring. Break (pop) bulbs apart into individual cloves within a few days of planting and plant the root end down, about three inches deep. Mulch immediately. Remember big cloves yield big plants and bulbs.Garlic needs fertile soil with lots of organic matter so the soil remains uncompacted through the long growing season. Growers with clayey soils should add a lot of compost before planting; those blessed with lighter soils could use some organic matter, blood meal and bone meal worked into the soil, or grow and till in green manures prior to planting. It is difficult to grow garlic without rot problems in tight soils or clay soils with poor drainage. Hardneck garlics are fussier about soil nutrients and texture than are softnecks. In the spring when garlic plants are experiencing most of their vegetative growth, water like any garden green. Nitrogen is appreciated at this stage of growth. Side-dress a little chicken manure, blood meal or compost. When days lengthen and the temperature climbs (mid-May for us) bulbing begins and fertilizing is useless. Garlic has finished growing green leaves and is ready to direct energy to its bulb. Small weak plants at this stage will produce small bulbs no matter what you do. Hardneck garlics send up a flower stalk (scapes) in early June. Before the stalk begins to turn woody, starts to uncoil, and begins to stand up straight, the stalk should be cut off 1/2 inch above the top plant leaf. This redirects the energy downward into the bulb. Begin to taper water off a bit. As harvest approaches don’t keep the topsoil too wet for any length of time or bulbs may mold or stain. As harvest approaches plants being to dry down from the lowest leaf up and from the leaf tips downward, one leaf at a time. Harvest when top 4 leaves are still 50% green. Bundle in-groups of five to ten plants and hang inside, out of direct sunlight and with good air circulation. Don’t leave freshly dug bulbs in direct sunlight for more than a few minutes or they may sunburn (literally cook). The plants and bulbs cure completely in 3 to 4 weeks in dry climates, but may need fans and heat sources in wet climates. Check clove wrappers inside bulb to make sure they are dry. When completely cured the neck may be cut about one-half inch above the bulb without any moisture being apparent. Trim the roots and necks to one-half inch length and store in netted onion bags or ventilated crates. 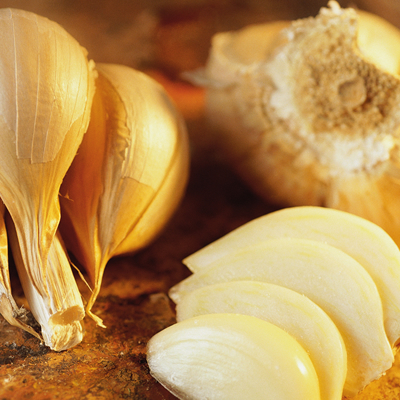 Most garlics store well at room temperature. Temperatures of 34 to 40 degrees will cause sprouting. Temperatures in the 30’s will begin sprouting. The type of garlic is also a factor. Asiatic and Turbans are the shortest storing garlics. Rocamboles and Purple Stripes are the medium (6 months). Porcelains and Artichoke types store 8 to 10 months. Silverskins and Creoles will often store a full year.